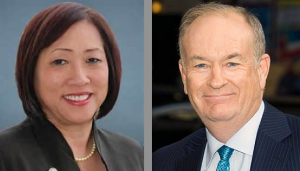 WASHINGTON — Rep. Colleen Hanabusa (D-Hawaii) responded on Jan. 4 to remarks made on Jan. 3 by Fox News host Bill O’Reilly on social conditions in Hawaii, and his characterizations of Asian Americans. “Now I have to say, Hawaii is one of my favorite places in the world. It’s beautiful,” O’Reilly said on his show, “The O’Relly Factor,” in a conversation with Fox News producer Jesse Watters. “Leave it to Bill O’Reilly to thoughtlessly insult 1.3 million people with one sweeping misstatement,” said Hanabusa. “Let’s set the record straight. For the fourth quarter of 2012, Hawaii’s major economic indicators were all positive. Visitor numbers are up, showing strength in our number one industry. Unemployment is down and personal income is up. The state’s debt is stable and reasonable. “However, I think O’Reilly’s attempt to characterize Hawaii’s Asian American population is most insulting of all. Claiming that Asian Americans are not liberal by nature because they are ‘hard-working and industrious’ is the kind of one-dimensional and paternalistic attitude that we should have gotten past decades ago. “Finally, there is absolutely no justification for O’Reilly’s claim that being ‘hard-working and industrious’ is in any way incompatible with holding liberal political views. Hawaii is the ‘bluest’ state in America, and it has been built through the hard work of generations of people of all persuasions. Those who have succeeded through their own efforts do not turn their backs on those who continue to find themselves in need. “We maintain our commitments to our seniors. We focus on ensuring that our children have access to educational opportunities. And we are industrious for the sake of our communities, not just for personal gain. Hanabusa looked like an idiot, as usual. Every liberal thought is filtered through the lens of perceived racism. I am embarassed to be from Hawaii with idiots like this representing us on national TV. Everywhere in the Hawaiian Island Employment circles the Asian Americans Dominate. Our Judges, legislatures, Police Departments, Police Commissioners, Teachers, University of Hawaii, employees in the State, Federal, and City and County are predominately Asian Americans. Not because Asian Americans are smarter than other races, but because they control Hawaii’s Social System. The hiring practices in Hawaii are out of line, favoring Asian Americans. As a 15 year old youngster roughly, 56 years ago, I searched the Newspapers Want Ad section for a job. It was not uncommon than to find then that the Employer would add comments such as “Japanese preferred,” “Orientals only,” and/or “non Orientals need not apply”. The Non-Oriental nationalities in Hawaii need to wake up. If we continue to allow our Hawaii’s social system the way we have been running it for the past 70 years, there will come a time when “non Asians” in Hawaii will be left without a culture. I am proud to announce that as a Black American I was born in Kamehameha School when it served as a hospital during the Japanese invasion of Hawaii in 1941. I love Hawaii and its people.